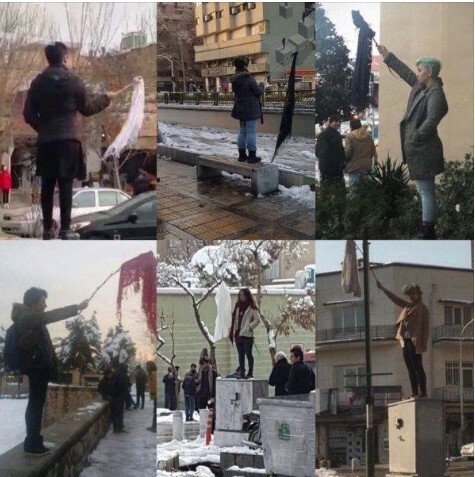 Of tens of women on the streets of Iran who started to take off their veils during the mass street demonstration of January 2018 to object the compulsory hijab law of the country, 29 were arrested. 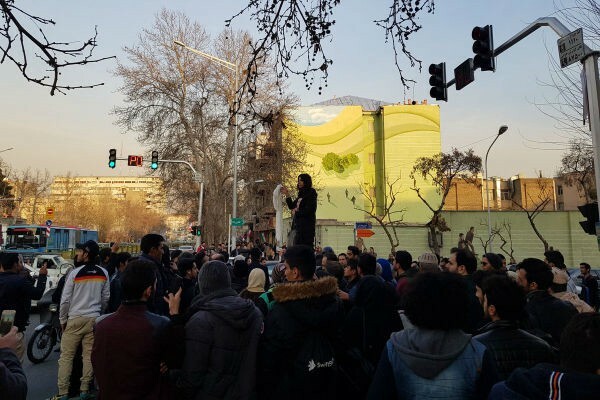 But most recently on 15 Feb, another women showed up to the original location of the first women who took off her veil: a power box on Enghelab street in Tehran. Azam Jangravi who had posted a message of protest on her social media accounts was live broadcasting her protest when police came to arrest her. She was holding a white veil in her hand when she was taken down from the power box violently by the officers. Some in the crowd that had gathered around Jangravi resisted the officers but she was ultimately taken into custody. This is Setareh’s* description of her experience participating in the recent demonstration of resistance against compulsory hijab in Iran. On Monday January 29, a number of brave women like Setareh climbed onto public platforms in Tehran and made a flag of their headscarves challenging the four decades of Islamic Republic authority which has forced Iranian women to cover their hair in public. Setareh is one of these women who have come to be known as the women of Enghelab Street. She is 25 years old and has recently graduated from university. Later Setareh spots a couple of policemen exiting a nearby building so she leaves the spot and walks away. I asked Setareh about her personal motivation. It is not just an issue of hijab. A regime that interferes in such basic and rudimentary matter of an individual’s life as their outfit, only attests to being a dictatorship in social and political matters. There have been numerous forms of protests to compulsory hijab but I believe this is the most civic and beautiful manifestation of the protest so far. Setareh says this protest also needs and is gaining the support of men who realize that compulsory hijab is an insult to them as well. She also speaks of the support of women who chose to wear the hijab but do not believe in enforcing it on others. She stresses that she will not invite others to join the protest or look down upon those who do not participate in this form of its manifestation conceding that these actions could end up being very costly in terms of how the government deals with protesters. She says a violent reaction by the authorities is not a far fetched idea adding that we could see a wave of knife and acid attacks on women. She observes that those arrested are already dealing with heavy bails which could be followed by heavy sentences. The least that can be expected could be a more violent presence of the morality police on the streets.